We are organising a second holiday in India in October 2018. 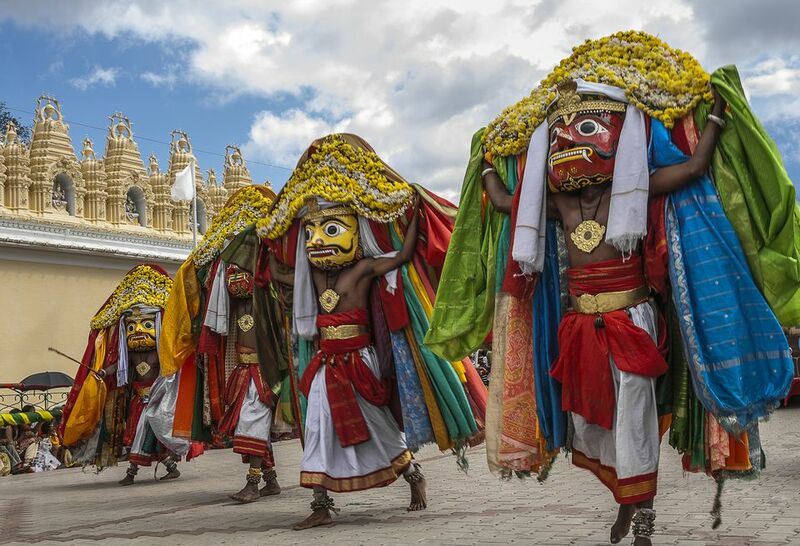 It will give you an extraordinary opportunity to see the Dasara Festival, which is huge in Mysore. The Green Hotel: The Hotel was set up as a model of sustainable tourism by the Charities Advisory Trust, our parent charity. All profits are distributed to charitable and environmental projects in India. It’s a small Palace, with a garden block. For the last 10 years our 2 acre garden has won the prize for the best garden in Mysore. There will be plenty of time for relaxation and sightseeing. Getting there: The nearest international airport is Bangalore. We can arrange to meet you at the airport. The most usual choice of flight is The British Airways one leaving Heathrow around 2 o’clock arriving at Bangalore at around midnight our time (5am Indian time). The return flight is BA Bangalore-Heathrow, leaving around 7 am, you can leave the Green Hotel around midnight, to get the Bangalore flight (these are current flight schedules and may change). Some guests choose other airlines -such as Gulf or Jet and have internal flight in India. You can also extend your stay either at the beginning or at the end of the holiday. Health: Mysore is not a malaria area, but we cannot guarantee that a stray mosquito will travel in from other areas. Prices are calculated on the £/rupee exchange rate of 87 rupees to £1 and include full board & accommodation and opportunities to visit projects supported by the Charities Advisory Trust and the Green Hotel. Please book by contacting us below. Don’t delay to make sure you get a place!